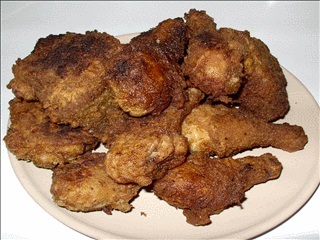 Makes a moist and savory fried chicken with a flavorful crisp coating. It is fast becomming a signature dish for Twenty mile Kennel. Our guests were never disappointed. Trim fat from chicken, wash and pat dry with paper towels. Shake in a bag with 1/4 cup plain flour. Add egg to milk and whip. Set aside. Place flour and spices in a large plastic bag. Close top and shake to mix all ingredients. Dip chicken piece in egg and milk mixture. Drain excess and place and place on a rack for a few minutes. Working with a few pieces at a time, place chicken in bag with flour and spices. Close top and shake to coat evenly. Remove chicken from bag, shake off excess flour mixture and place on clean, dry rack. Allow to air dry for about 20 minutes. Heat skillet with 1/2 inch cooking oil to 365°F (remember where the control knob is set). Carefully place chicken pieces in hot oil (tongs are a handy tool). While placing the chicken in the pan, turn the heat up full and then return to the 365°F knob setting when you cover the chicken. Cover and cook over medium-high heat (watch for a nice rolling sizzle) until nice and brown on bottom. Turn with tongs and continue cooking uncovered until nice and brown. If in doubt, check for an internal temperature of 170° for white meat, 180° for dark meat, with a thermometer. Remove from pan and place on a rack to drain.